We came across a super fun and unique fundraiser that we wanted to share with you! Let us introduce you to our friends at We Help Two. This fundraiser allows you raise funds for your adoption and help the homeless at the same time by selling and donating socks. The good news is that there is no upfront costs or minimum sales required for this fundraiser! It’s a win-win. Plus, the socks are SUPER CUTE and high quality. Check out our interview with them below to learn more about their organization and how to get started if you want to host your own We Help Two fundraiser. Who is We Help Two? Hi, we are Trevor and Bethany Bergman, and we have two boys Jackson (who was ironically born in Guangzhou where all Chinese adoptions are finalized) and Jordan. We live in El Paso, Texas in the borderland. We run and operate We Help Two. Trevor also works part time for a prosthetics company that helps amputees in the developing world and Bethany also stays busy homeschooling Jackson and Jordan. What is We Help Two? 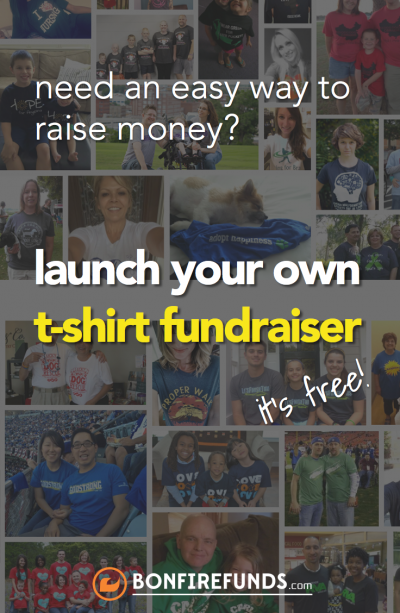 We Help Two is a fundraising platform that helps TWO causes with every transaction. We Help Two partners with organizations, churches, schools, families and individuals to raise money for their cause and helps the homeless at the same time. After being in the education and nonprofit fields for a combination of 14 years, we learned a lot about the pros and cons of fundraisers. We Help Two was created to try and cut out as many of the cons as possible. How Does We Help Two Work? The slogan for We Help Two is, “Sell Socks, Raise Funds, Help the Homeless.” Hosts who choose our fundraiser sell packs of funky socks (3 pairs of socks in a pack) at $15 a pack, the host keeps 60% of the sale, and for every pack sold We Help Two donates a pair of warm, thermal socks to the host to donate at a local homeless shelter. Online Campaign – This option allows hosts to create a personalized online campaign. They have the option to add a photo and a video, and they are given a customized URL to share via email and social media. There is a sock ticker that helps keep track of how many packs have been sold, and guests can leave messages on the page to encourage the hosts. When hosts choose this option, We Help Two takes care of all the money and order processing. At the end of the campaign a check is mailed to the family along with the warm socks to donate. Check out this online campaign example. Pre-Orders – This option allows hosts to collect orders from friends and family in person and collect money upfront. This is great for a work or church community. This option saves the customer a few dollars in shipping (shipping is added via the online campaign purchase). We Help Two will fulfill those orders at the end of the campaign and will invoice the host for $6 per pack sold. Shipping is also charged for the box of socks at the end. Some hosts choose to charge $16 for in person orders to cover that shipping charge at the end, and it’s still cheaper than the shipping charge for an online campaign order. 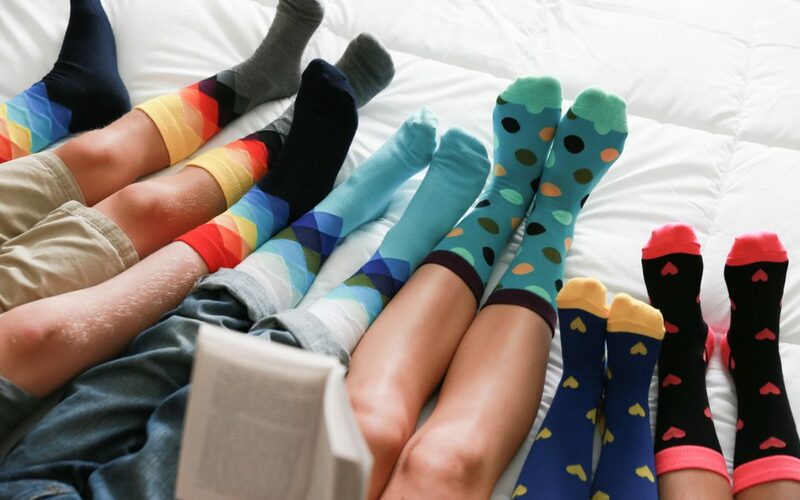 In Person Orders – This option allows the host to have a box of socks shipped directly to them at no charge. The host sells as many packs of socks as possible and at the end they are charged for the socks they sold plus the cost of the return shipping. Any packs that are not sold can be sent back. Families that do most of these things earn over $1,000.00. Our highest-earning adoption campaign has earned $1,917. Families that do not put in as much effort (based on life circumstances etc.) usually earn between $200-$700. For those that are willing to work, though, the potential is there. 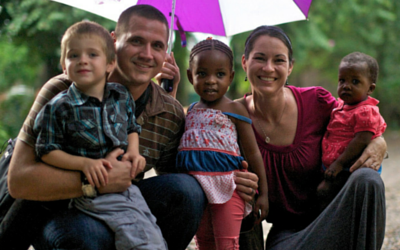 One family single-handedly raised over $5,000 to provide a solar water pump in a remote village in Kenya. What is the Sample Pack? The sample pack is a package that includes one of each of our funky sock packs (men’s, women’s, boy’s and girl’s) and it also contains a pair of the warm thermal socks that gets donated to the homeless. The sample pack is great for hosts to use to promote their fundraiser with personal pictures and videos of them wearing the socks. The cost of a sample pack is $36 and that includes tax and shipping. How Do Hosts Get Started? It’s simple. Hosts can visit our website and click “Start A Campaign.” Hosts can also email Bethany and Trevor at [email protected] to order their sample pack to get started with in person sales. Here’s a real life example: Laura Kelly hosted a “Socktober” campaign in October 2016. They were raising money for the adoption of their precious son Everett Shuai Kelly. 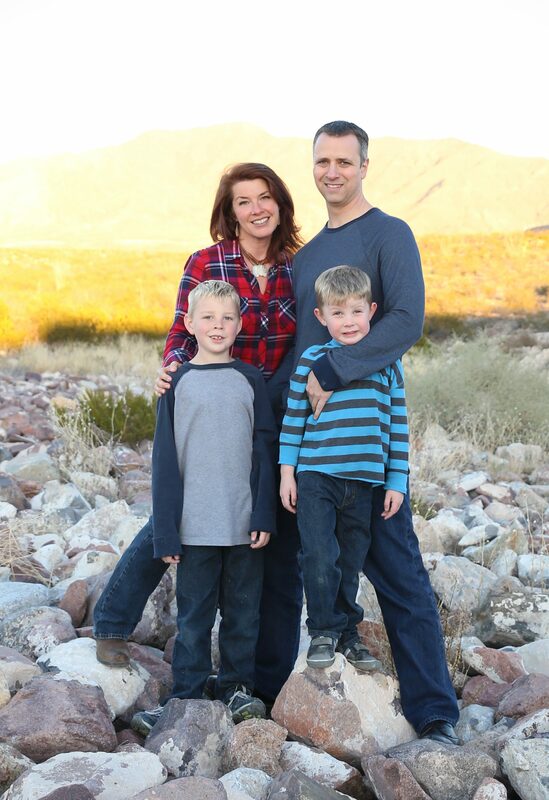 The Kelly’s were very close to their travel date so they chose only to do online sales. 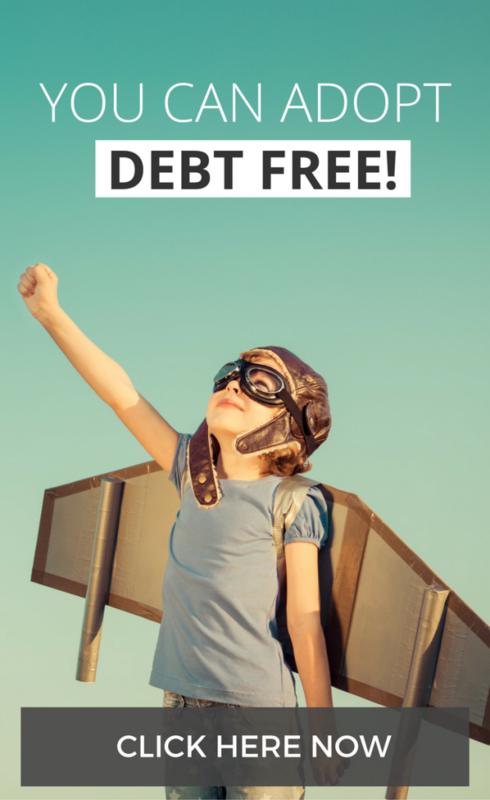 Laura utilized her blog and her social media sites to get the word out. The Kelly family was able to raise just over $1500.00 and were able donate 166 pairs of warm thermal socks to a homeless shelter in Tennessee. 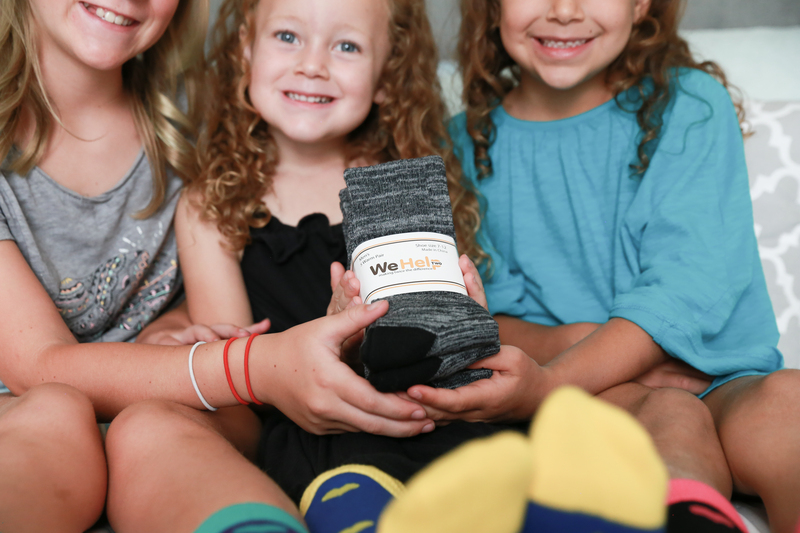 Children give back with a pair of donated socks with the We Help Two fundraiser.